Hey everyone! I was inspired to do something different today... I wanted to make pixel art in Minecraft! After searching and searching for the perfect thing to build, I found a picture of a Super Mario mushroom. I thought that this was so cute and that I absolutely had to make it, and so I did. And that's what I wanted to share with all of you Minecraftians today! Using black carpet, place eight blocks horizontally. This is the base of your mushroom. Then, still using black carpet, place blocks as shown in the second picture. Finally, make the black part that separates your top from your bottom. 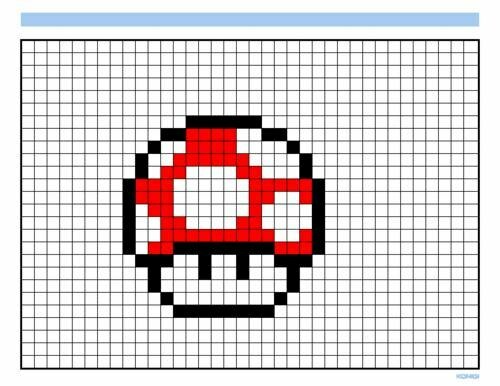 Now finish your mushroom by adding the blocks shown in the pictures to make the top of your mushroom. Add some eyes and other outlines. Step 5: Decorating and Filling In! Now you're mushroom is done! Thank you for viewing and I hope that you liked it! Check out my other Minecraft tutorials and enjoy your cute mushroom! I cannot wait to make this! I'll share a pic of it when I possibly can. show us how to make master cheif! What is your request, peach girl=)?